One of my favorite Christmas cookies of all time are the nut turnovers (sambusik) my grandmother used to make. These were the only cookie I remember her baking. My aunt told me recently, these were her signature cookie. She made them every Christmas for as long as I can remember. We would always wait with anticipation for her to start her baking. My grandmother came to this country when she was 16 with an uncle, leaving behind her mother, father and 5 sisters. Full of hopes and dreams for a new and better life, she embarked on an adventure knowing she would probably never see her family again. She came with a bag of her belongings, a lace trimmed hankie from a dear friend, and all her mothers recipes burned into her memory. She lived with family in N.J. and a marriage was arraigned. With the help of her aunt that marriage never took place. Ever the independent strong minded woman, she met and married my grandfather while working in Thomas Edison's factory. While I was growing up my grandmother was the heartbeat of our family. I am so lucky to have wonderful memories of her, and many of her recipes handed down from my mother. These cookies are so delicious and are now part of my Christmas baking. They are flavored with mahleb, which is the pit of the sour cherry used in breads, cookies and baked goods in the Middle East, and orange blossom water. You can find mahleb at Penzey's here. You can find orange blossom water in middle eastern grocery stores and online. In small bowl mix all ingredients for filling. Mix all dry ingredients. Add melted butter and milk and knead thoroughly. Roll out and cut into rounds. 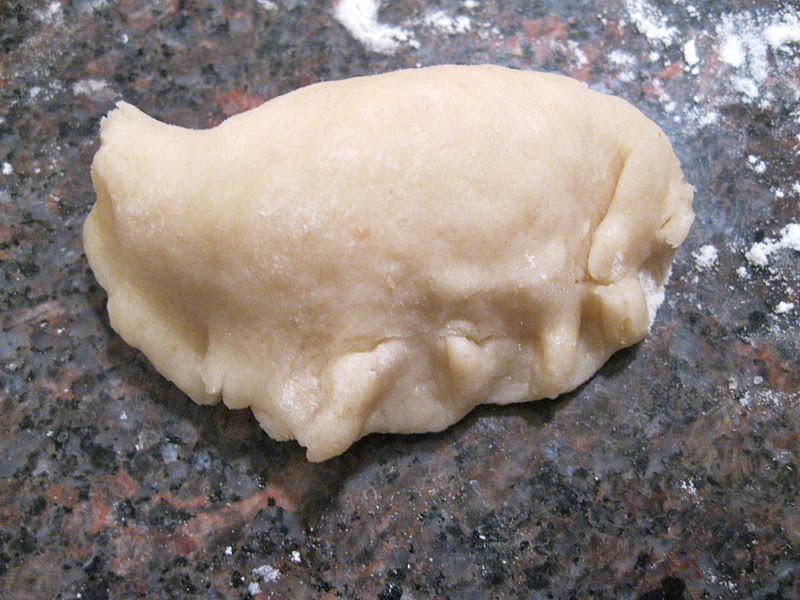 Put a spoon of nut filling onto each round and fold dough over to form half moons. Bake at 350〫20 minuets. Bottoms will be browned. When cool roll cookie in confectionary sugar. This post is part of a #cookielove Blog Hop...check out the fun! These are so fun to eat. I love the powdered sugar coating! Kathy-Sitting here, reading the precious story about your grandmother, brought tears to my eyes. Your stories of the past, always intrigues me, because I too have similar stories that would fill an entire page to talk about it! Mahleb is new to me - but I love the sounds of this - reminds me of some Eastern European cookies I used to have in NYC. Grandmothers - immigrant grandmothers - such stories of strength and guts! I can never hear enough - or appreciate enough about them. These cookies look simply wonderful! And I love your logo - a cookie in each hand. Thank you for sharing the recipe, and your wonderful photos. These look delectable, Kathy. I so enjoyed reading about your family memories-that's what Christmas baking is all about, isn't it? I have seen orange blossom water here and I am going to look for Mahleb so I can make these. these cookies look delicious! i love the orange blossom water touch. :) sending some #cookielove to you! thanks for joining our #lovebloghop! Oh, your cookies are just beautiful and they look so delicious...my mouth is watering! I will try these, my husband loves this sort of thing that is sort of a cookie/pie type of deal. Now, about your comment on my blog re the ending of TWD, why don't you jump in when February comes along and post now and again on the Baking with Julia (Dorie Greenspan book)? I have not done right by FFWD, but I do love the book. I just have too much food blogging going on...need to sort out some of it! Hope you are having a wonderful holiday season. Kathy, those cookies are simply mouthwatering with nut filling! These cookies look very tasty, and how ownderful that they evoke such warm memories of your grandmother. These are the best sort of cookies. Belli e buoni questi biscotti..brava!! What a beautiful recipe (and post)! Wow, I am so glad you participated to our bloghop! Your lebanese nut turnovers are awesome, really, they sound fantastic!! My mother ( from Zahle) also made these. When closed, she turned over each cookie edge so it looked like a beautiful refined rope. She also used (just a sprinkling) of confectioners' sugar or alternatively, dipped each in a "simple syrup" flavored with either orange blossom water or rose water. It's always interesting to see the variations of family favorites. My grandmother and great grandmother used a rosewater simple syrup on these cookies growing up. I've never had them with powdered sugar. My great grandparents came here from Beirut in 1912. My grandfather was their first American born child. My grandmother learned all of my great grandmother's recipes for him. Even after they divorced (13 children and 30yrs of marriage later) she continued cooking all the Lebanese foods. The Bread with fennel, cabbage & grape leaf rolls, Kibbeh, Tabouli Supreme. And the Moon Cookies.